Jackson Academy is pleased to announce that it has been recognized as an Apple Distinguished School for 2015-2017. 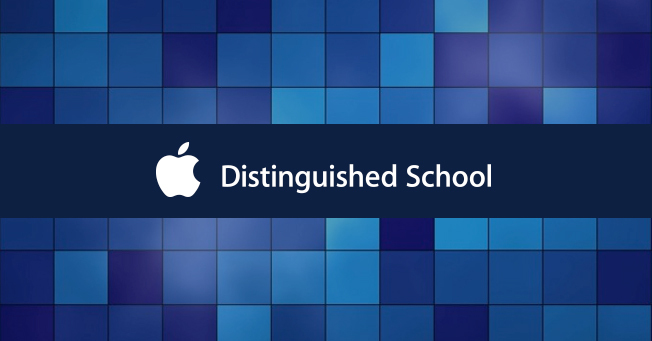 The Apple Distinguished School mark is reserved for programs that meet criteria for innovation, leadership, and educational excellence, and demonstrate a clear vision of exemplary learning environments. In 2013, JA joined a small group of schools and colleges worldwide recognized as Apple Distinguished Schools. To be renewed as an Apple Distinguished School, JA submitted an application and extensive documentation. At JA, each student, grades kindergarten through twelfth, has an Apple device (Macbook Air or iPad) that empowers students and teachers to enhance learning. JA is among schools that have pioneered the adoption of the one-to-one approach to learning and has assisted schools in Mississippi and other states that are developing similar programs. Technology enhances learning in a myriad of ways. In Middle School STEM labs, students use their laptops to complete daily lesson modules, collaborate during team exercises, and refer to guidelines during hands-on experiments. Students benefit from the use of online resources to expand research possibilities and collaborate with other students on assignments not only on campus but off campus as well. Students use technology to express learning in ways other than the traditional paper and pencil, including creating a variety of media content, to better express mastery of topics. Teachers have begun using iPads instead of dedicated interactive boards for presenting content, and they use video blogging to inform students about classroom information. Teachers employ technology to post lessons, assignments, and content to an online portal so that students, parents, and teachers can monitor student progress. Jackson Academy’s original mission in 1959 was considered innovative: to teach reading by phonics. Counter to academic trends at the time, JA’s founders believed—and evidence showed—that phonics, in-depth reading, time for play, and exploration of the arts all contributed to stronger student success. As a college preparatory school in the heart of Jackson, JA continues to embrace innovation today. Preparing students for their best future remains at the core of the school’s purpose. The school’s four-point educational philosophy—positive, collaborative, progressive, and student-centered—embraces the belief that, given the rapid change occurring in the world, if a school is not ahead of the curve, our children will be behind. Jackson Academy remains committed to pursuing a learning environment that blends the best of innovation, historically recognized educational principles, and well-loved traditions.